In this article, I’ll take an in-depth look at what I see as the most significant trends in digital marketing for the year ahead. But, it’s not only my view, since I have ‘crowdsourced’ the importance of the different trends rated by the popularity of each trend. For all members of Smart Insights, we also have a more detailed free download of the marketing megatrends for 2017, which are 9 digital marketing and martech megatrends will help give you an edge in 2017. In the download we discuss machine learning and artificial intelligence, which for me is the biggest trend in marketing right now. Machine learning techniques apply across many of the techniques we discuss in this post including Big Data, Marketing Automation, Organic Search and Social media marketing. If you want to know more about the defition of digital marketing before starting on trends, see our post on What is Digital Marketing ? While this doesn’t have a controlled sample of our free research reports like Managing Digital Marketing, it does canvas opinion widely. Note that these trends aren’t necessarily the most important channel by volume of leads or sales, rather it is the tactic which will give the biggest increase in the year ahead, so it shows what is becoming more important. By asking for just one tactic, this helps shows the top 3, 5 or 10 top-level trends. In our Digital Channel Essentials Toolkits within our members’ area and our Digital Marketing Skills report we simplify digital marketing down to just 8 key techniques which are essential for businesses to manage today AND for individual marketers to develop skills. This visual shows the core techniques which will drive more leads and sales for you, but within some sectors, techniques like using AI, IoT, Wearables will be more important. The Top 14 marketing techniques in 2017? Let’s now drill down into the key tactics and marketing technology within each of these tactics which will be important in 2017. Content marketing has been in the top 3 for the last 3 years we have run this post, so we focus a lot on how to create an integrated content marketing strategy through advice in our content marketing toolkit. Our research with HubSpot, illustrated in the Competing on Content infographic, shows that more businesses are now using a strategic approach (40%), so this is a trend we can expect to see continuing in 2017. We can also expect that there will be more focus on Measuring Content Marketing ROI as the cost and competition within content marketing increases. 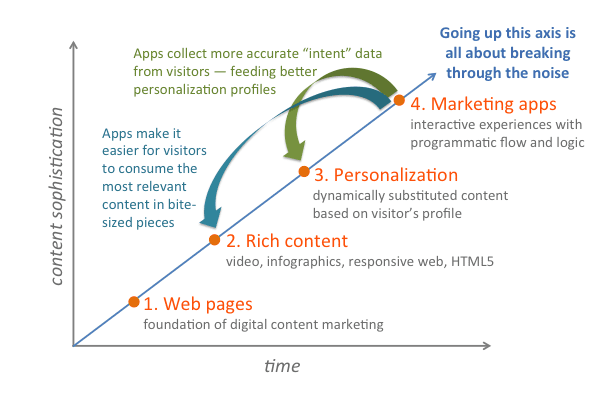 At a practical level, Martech Guru Scott Brinker has talked about the 4th Wave of Content Marketing and I’m seeing more and more examples of interactive marketing apps – like our capability graders and also personalisation tools recommending content. Read his article, introducing it, a great read and you can check out the ionInteractive examples of interactive content marketing. As defined in our question, Big Data marketing applications include market and customer insight and predictive analytics. The 3Vs of Big Data show why this is a key trend selected by many, who have experienced the increase in volume, real-time data and data formats in their business and want to exploit the value to increase sales through personalisation on websites and through email marketing through predictive analytics – a topic we have covered many times on our blog. It’s also closely tied into machine learning where Big Data is mined to identify propensity to convert given different customer characteristics and behaviour. 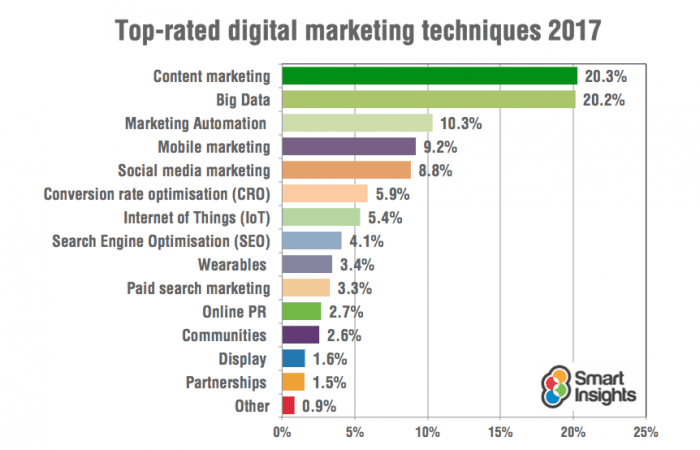 Like content marketing, marketing automation has been in the top 3 for the last 5Â years we have asked this question. 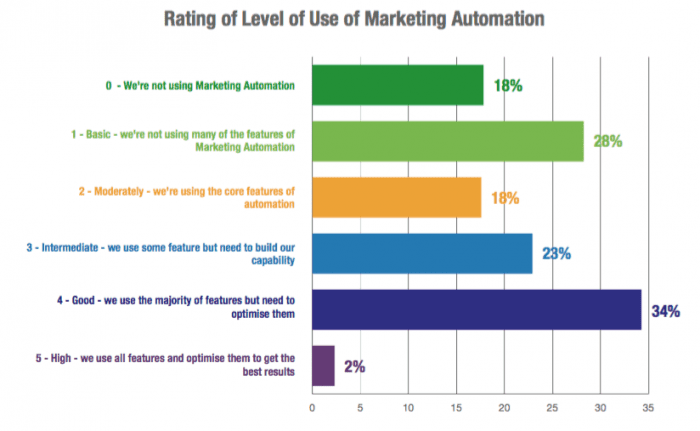 Many businesses still have potential for improving their automation as our research on the State of Marketing Automation shows. To help with this knowledge gap, I think I have given more webinars and talks on Marketing Automation than on any other topic in 2016. The most common questions at the end are ‘where do we start’ and ‘how do we get to the next level’. These questions are answered in our Email marketing and marketing automation toolkit which includes a free interactive capability review to score your use of email marketing automation. As businesses progress up the learning curve I expect more businesses to be putting lead scoring in place, or refining it and learning the best places on the journey to feature content through predictive analytics. ‘Mobile first’ is also misleading if we look at the overall customer journey since often different devices may be involved at different points. So a better vision for mobile strategy is treating it as part of a multiplatform or multichannel strategy. As this data from comScore highlighted in our mobile marketing statistics research shows, the multiplatform ribbons for all countries are much broader than users who are mobile only or desktop only. Trends in social media marketing are often controlled by the efforts of the social networks to monetise and this has seen Facebook and Instagram, in particular make changes such that businesses now need to ‘pay to play’ to get the reach needed to have an impact. They have continued to innovate in their targeting and remarketing options. Jason DeMeyers has these interesting views on social media trends for 2017. This is the technique I selected a year ago as the way Smart Insights would see the most growth from in the year ahead. It’s higher in popularity than previous years, but I still wonder whether many businesses are missing out on a more data-driven approach to increase leads and sales from their websites. I saw this chart of the volume of structured tests presented by a major multichannel retailer who wanted to scale the number of tests they were running. It a great way to show the need to test extensively since only a third have a positive test. 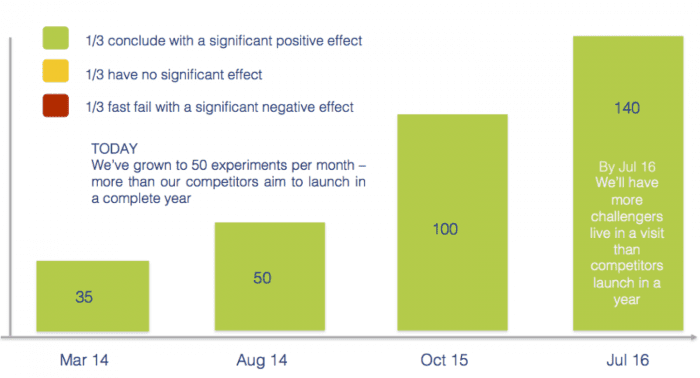 It also shows how competitors may be getting ahead if they are testing more extensively. 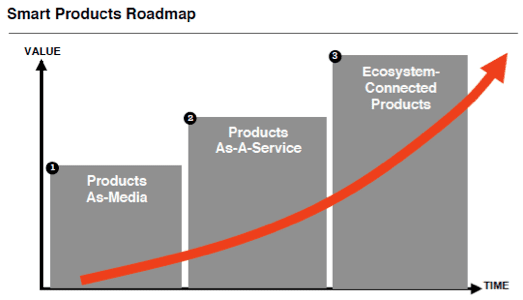 IoT is one of the most important marketing technology applications of the last 2-3 years, but it is of most relevance to devices makers and retailers, so it is relatively high-up in this ranking of priorities. There are expected to be 75 billion connected devices by 2020, meaning there will be ten times as many devices able to talk to one another as there will be people on the planet! The implications are huge and far ranging. 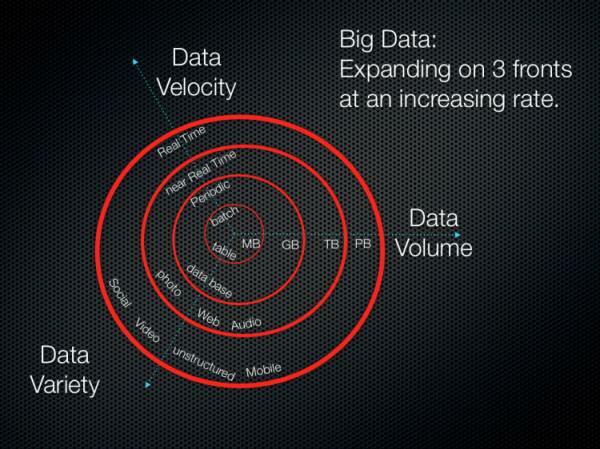 All this sharing of data will transform the way we live our lives. Online PR today is inextricably linked with Content marketing, SEO and Social media, or it should be. But this doesn’t get a top rating since the others are important. These are branded niche or vertical communities. This includes banners on publishers, ad networks social media including retargeting and programmatic. A neglected aspect of digital marketing, perhaps unsurprisingly unsexy. Account Based Marketing (ABM) – relevant for B2B marketers targeting large accounts we have a new guide in our B2B toolkit on this early in the new year. Omnichannel and multichannel attribution – both good for reminding us that it is the way that these channels work together to support each other that is often most important – the reason why many members are looking for advice on an integrated marketing strategy. 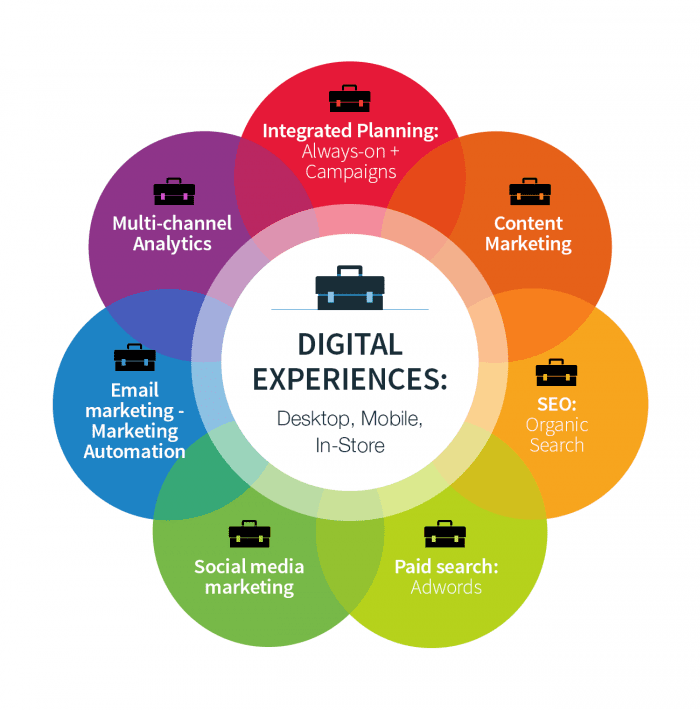 Digital Marketing is today’s trendy and emergent industry in which has lots of changes and updation in day by day. Nice info you have shared.